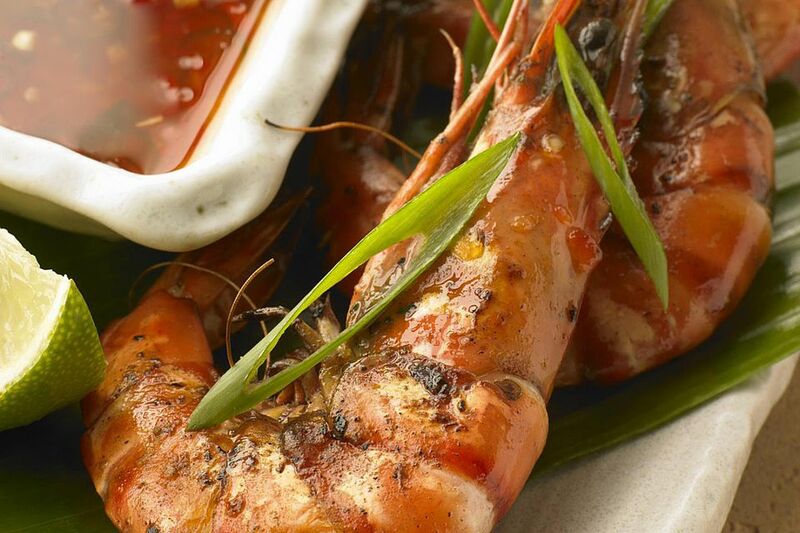 In Australia, this Barbecued Shrimp with Thai Dipping Sauce appetizer recipe has replaced the old standard, and less adventurous shrimp on the barbie served with what Aussies call "seafood sauce"—a mixture of mayonnaise and ketchup. Nowadays, it's common for Thai dipping sauces such as nam jim to be served. Nam jim is a combination of Thai fish sauce, lime juice, palm sugar, chilies, garlic, and cilantro. These spicy, sweet, salty and sour flavors pair particularly well with fresh seafood like scallops and crab. When barbecuing shrimp, it's best to leave the shell intact. This keeps the shrimp juices inside the shell, so the shrimp stays moist and succulent. The shell is removed just before eating. In a small bowl, combine 2 tablespoons Thai fish sauce, 3 tablespoons fresh lime juice, 2 crushed garlic cloves, 2 teaspoons palm or brown sugar, 2 small finely chopped red-bird chilis and 2 tablespoons finely chopped cilantro leaves and stems. Set aside. Heat a grill to high heat. Barbecue the shrimp with shells intact for 1 to 2 minutes on each side or until pink and the shells start to char very slightly. The cooking time of the shrimps will vary depending on their size. Remove shrimp from grill and serve with dipping sauce on the side.